Primitive custom of "kolinje" starts off every winter on last weekend in September. 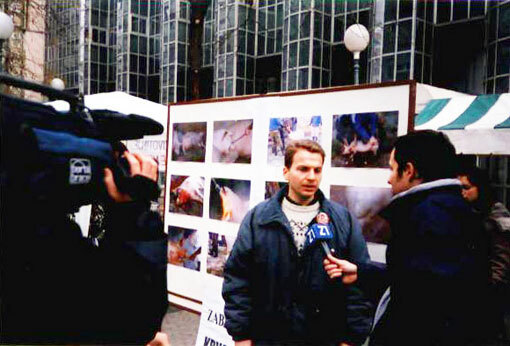 Pig slaughter in backyard or "kolinje" always results with hundreds of thousands of backyards soaked with blood and many cases of Trichinellosis. People in country households torture and slaughter pigs demonstrating the most brutal act in a relationship between man and animal. It is considered to be a great part of Croatian tradition and an opportunity for party and folk entertainment. 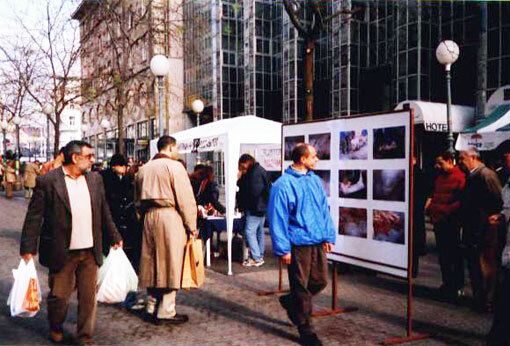 On September 27, 2004, at noon, in front of Dubrovnik Hotel in Gajeva ulica, our activists will set photo gallery with scenes of "kolinje" on two-meter panel. Video showing "kolinje" will be projected on the info stall, and info materials will be handed out. Animal Friends fights for ban of "kolinje," as the European Union dealt with this cruel, primitive and non-hygienic practice long time ago. Animal Friends sent a report on situation in Croatia along with short video footage showing backyard party called "kolinje" to many addresses all over the world. Ban of animal slaughter in households, would stop slaughter of fully conscious animals as the most brutal act of human beings towards domestic animals, ensure higher level of hygienic conditions and decrease cases of Trichinellosis on Croatian dinner plates. Ethical changes in world society demand ban of custom of backyard slaughter through legislative regulations. Croatia must start changing its relationship to animals, its cruel customs and its bad laws. In the Animal Welfare Bill made by our organization, which is constructed in compliance with the EU laws, among many changes we also proposed the ban of backyard slaughter of animals in country households. World condemns low ethical standards and Croatian government should carefully consider which customs should be preserved and which banned before the countries of Europe and the world impose it. We want to send a message to people of Croatia that backyard slaughter isn't fun or valuable tradition, and that they shouldn't pass on to their children such shameful cultural heritage. Pigs are sensible and sensitive animals, and as intelligent as dogs. When slaughtered, their throats are slit and they are left to bleed to death while fully conscious! With nerve system almost identical to humans, pigs are aware of the knife and feel intensive pain just as man. During holidays when we celebrate peace between people, slaughter of animals is contradictory with our good attentions. When we become indifferent to suffering of other creatures and loose respect for life of an animal, we also loose respect for life of a man. 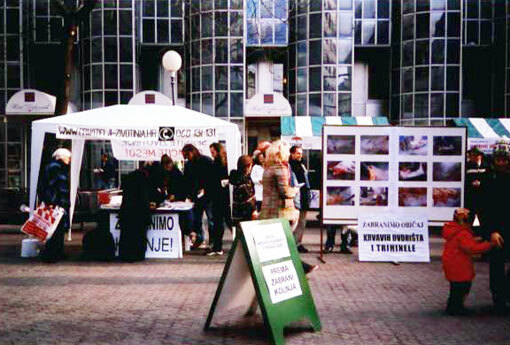 We ask people to see short video footage of "kolinje," to take a look at photo gallery of "kolinje" and to send a protest letter to Croatian government, and that way support our initiative for ban of animal slaughter in private households and for change of catastrophic Animal Welfare Act. We hope that time of "kolinje" across Croatia has passed, that the custom of bloody backyards and Trichinellosis will die out and the primitive practice will be banned by law.